AMMONNEWS - Israeli Prime Minister Benjamin Netanyahu will travel to Brussels on Monday, his office said, for a meeting with US Secretary of State Mike Pompeo. Netanyahu’s office said the meeting had been set last week, but provided few other details. “The two will discuss regional developments,” a statement from Netanyahu’s office said, noting he will be accompanied by the head of Israeli spy agency Mossad, the head of his national security council and his military secretary. 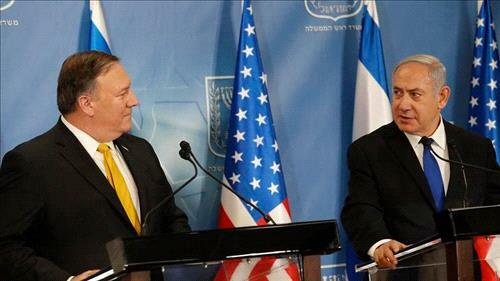 He was expected to leave Israel at around midday and meet this evening with Pompeo, who will be in Brussels for a NATO meeting of foreign ministers on Tuesday. Netanyahu’s trip comes a day after police recommended indicting him and his wife Sara for bribery and other offences, the third such move against him in recent months. The attorney general must now decide whether to indict Netanyahu, who rejects the accusations against him in all three cases. Israel and the United States have worked closely on a range of issues, particularly regarding Iran. Both have warned of Iran’s presence in Syria, which neighbors Israel. Netanyahu has pledged to stop arch foe Iran from entrenching itself militarily in Syria and to keep it from transferring advanced weapons to Hezbollah in Lebanon. President Donald Trump has pledged his unwavering support for Israel and has pushed ahead with controversial policies such as moving the US embassy to Jerusalem.